Hello, dear listeners! It’s me, Rev. I got to co-host this fine episode and Andy and I were graced with the company of the iconic Susan Meagher (it’s pronounced Mah-her). The entire show was a pure delight – from the delicious Old Fashioned to the discussion of the decline of the old Xenaverse community. I can’t even begin to recap all of the things we chatted about; we were all over the place but all of it was relevant. I know, that’s a shock, but I think it’s true. Some of it’s a haze because of the booze but I remember laughing a lot so that’s got to be a good sign, right? Be sure to check out Susan’s website (http://www.susanxmeagher.com) and the Brisk Press site where you can buy all of her books (and Starting From Scratch by Georgia Beers) in print or ebook (http://www.briskpress.com). 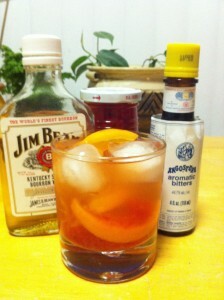 Mix sugar, water, and angostura bitters in an old-fashioned glass. Drop in a cherry and an orange wedge. Muddle into a paste using a muddler or the back end of a spoon. Pour in bourbon, fill with ice cubes, and stir. I topped mine off with water and added an extra orange slice and a couple extra cherries. I hope you all enjoy the show as much as I did. And don’t forget, feed those bards!! Fantastic show, I really enjoyed this one. I could relate to Susan Meagher’s experience in the early days of Xena’s online fandom. There really was a sense of community back then and now I feel a little guilty that I never wrote any fan mail to Meagher (I still have to pronounce it “meag-her” in my head if I want to spell it right). I’ll have to get right on that. Thanks, Rio. It’s more important to spell it right than pronounce it right–so you’ve made the best choice . I was surprised to hear how authors really like to hear from the readers through e-mail. I think I will try to start doing that. Also when I saw her new book on her website it still had the old title to it and I thought to myself that the girls from cocktail hour are gonna be happy they got a western outta Susan. Now I know thats not the case.